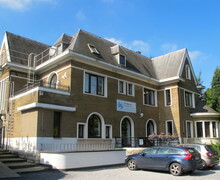 ISF (International School of Flanders) Waterloo International School is situated on the borders of the Flemish commune of Sint-Genesius-Rode, and the Walloon commune of Waterloo, in Brussels’ southern suburbs. 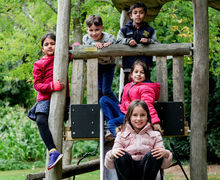 Our campus comprises 5 separate buildings, two large playgrounds with different play zones, and 2 car parks. All of our buildings are named after significant people or places in the Battle of Waterloo. This building was built in the 1920’s by a marble merchant. All school visitors are received here. The offices of the School Leadership and Administration Team are located on the ground floor. The Staff Room and the Advanced Study Centre can also be found on the ground floor. The first floor is dedicated to learning French and consists of 3 classrooms, a teacher preparation area and study room. 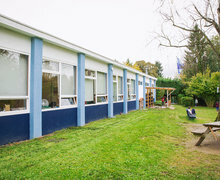 Wellington House is linked to The Hougomont Arts and Sports Complex by a basement area that houses Music classes as well as a fully equipped kitchen used for special events both by classes and by the PTA. 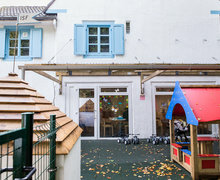 At ground level we have the Papelotte Wing, housing Primary Classes 1-3 (4 to 6 years of age). 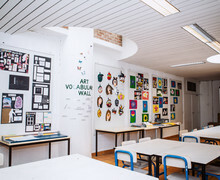 At underground level you can find the Art Room and our full-size Sports Hall. 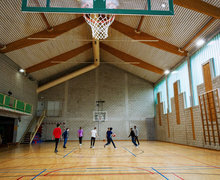 This multi-purpose gymnasium is used for our morning “Jump Start” sessions, for sports lessons, as well as functioning as the school’s auditorium and examination centre. The pull-out tiered seating system can comfortably accommodate over a hundred adults at our regular school shows. Primary Classes 4-7 can be found on the left hand side of this building. To the right as you enter are the MIddle School and IGCSE classrooms, as well as our recently updated Science Lab. 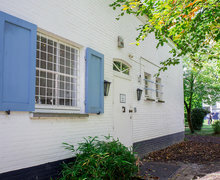 This villa houses the Media & Learning Centre. The MLC consists of a large research area, reading room and study areas for smaller tutorial lessons, for English Language support lessons (EAL) and by our Occupational Therapist. 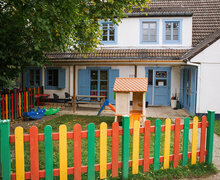 This villa houses our youngest students (2 ½-4 years). Here our Pre-school children have a corner work area, a group time & movement room, a dining room, and a fully equipped kitchen – as well as their own outdoor play area. ISF International Daycare is the latest addition to our campus. This new project incorporates innovative design with scientific research into the well being of babies and toddlers. The Daycare has its own access point and outside space. 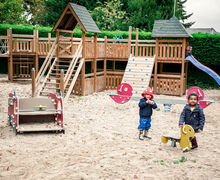 In this safe, sanded playground our youngest children have fun building sand castles, using the swings, slides and see saw, or inventing games inside the play house or on the fire truck. This large green natural playground consists of different zones. 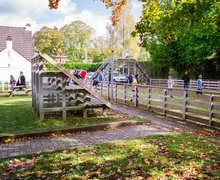 The Sports Zone is equipped with a Multisport Arena by KOMPAN, the Danish premium playground equipment designer. The Adventure Zone has a zip line, rope courses, slide, swing, balancing beam and stepping stones. In the Quiet Zone there are picnic tables and vegetable gardens. In the Tiled Zone students can play human chess, 4 square, badminton, snakes and ladders, or hopscotch – just to name a few! Staff & Parents can use either of our 2 on-site car parks.